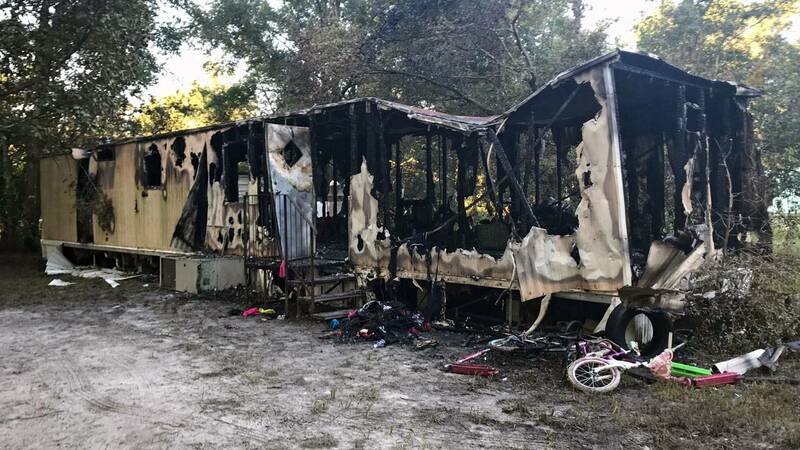 PUTNAM COUNTY, Fla. - Two young children were found dead early Sunday morning after Putnam County firefighters knocked down a fire in a Pomona Park home. First responders were dispatched to a mobile home on New York Lane around 12:45 a.m. Firefighters found the home engulfed in flames with two children believed to still be inside. When firefighters were able to get inside, they found the bodies of two children. Family members identified them as Zayden Sharper, 4, and Na'ziyah Sharper, 5. "I don't know what to say," the children's mother said, expressing her grief on Facebook Live. "You never know." Sheriff’s Office detectives are helping the state Fire Marshal’s Office investigate the fire. Water Plant Operator Robert Briant stopped by the home after the fire. He said the family has lived there for only a few months. "I hope people can get together and help them out and get them a new place," Briant said. According to Chief Quin Romay with Putnam County Emergency Services, calls for service are up. Rescue officials say they're getting 50 to 60 calls per day. "We're close to 16,000 calls (this year)," Romay said, referring to fire and EMS calls. "Generally, we end up to just under 20,000 calls a year." In hopes of getting those numbers down, Romay said it all comes down to education and prevention, like having smoke detectors and fire extinguishers.